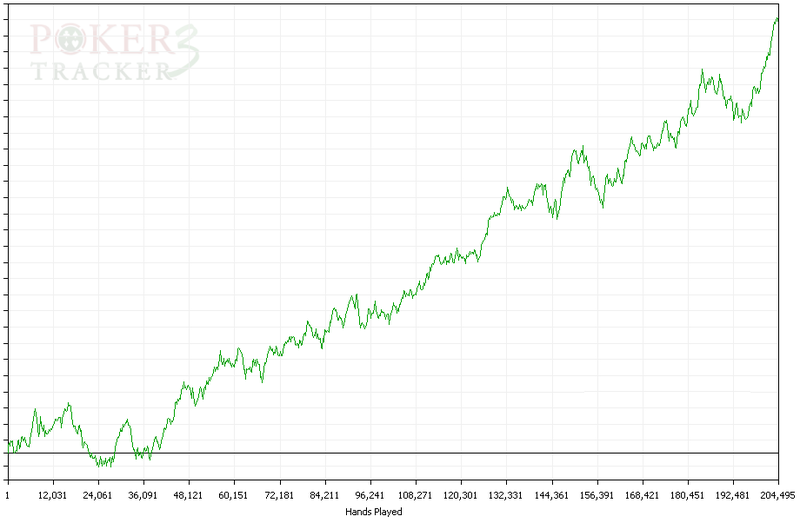 So I’ve quit poker for good in anticipation of my impending move to Argentina. It was extremely bittersweet for me to cash out my entire PokerStars account today; happy for the money, sad to leave it all behind, disappointed I didn’t win more. But poker has enabled me to have a life that wouldn’t have been possible otherwise, and the game has bailed me out of more than a few financial crunches. My trip to Buenos Aires, in fact, is largely funded from these poker winnings. Pasted below are my results for 2009. It’s true that a lot of people have played more hands than me, spent more time studying the game, and have made much more money than I have — but I’ve done better at this game than 90% of people ever will, and so I take a little bit of pride in that. Sort of a pretty graph, eh? So that’s a tad over 200,000 hands in 6 months versus 16,585 different opponents. It’s hella hard to get money onto PokerStars these days, so I hope this teaching gig works out in South America otherwise I am S.O.L. as far as career options go. At least I have another Stars t-shirt coming my way. wow you must be rich…. are you buying buenos aires? you are as good as chris moneymaker i bet. I’m ballin’ so hard now that I can finally afford to order THREE items off the Dollar Value Menu. Sick life, imo.